Workforce is an industry leading HVAC software that can make your business more profitable with simple changes. Our cloud based platform enables faster and more effective communication between office staff and field teams, ultimately boosting productivity and customer satisfaction. When a new job is scheduled for a member of your field team, they instantly receive a notification on the Workforce app, complete with all job details. You can also automate an email with this information if you prefer. Office and field workers are kept in constant contact without the need for lengthy discussions or movement back and forth. Beyond aiding in scheduling, the GPS tracking tool is also an excellent field team management tool, allowing office staff to stay on top of timekeeping. The benefits of Workforce’s cloud based platform also extend to the field team’s increased capabilities. 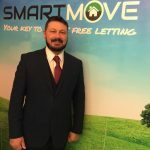 Any data they collect on site will automatically sync back to the office, including getting jobs signed off, a change in job status or a collection of payment. This increased responsibility eliminates unnecessary dead time in your field team’s day and is always kept under the watchful eye of office staff. Providing great services to customers can be enabled by HVAC software and made incredibly easy with Workforce. Simplify the way heating, ventilation and air conditioning services are delivered across the board with intuitive scheduling tools and job management features. 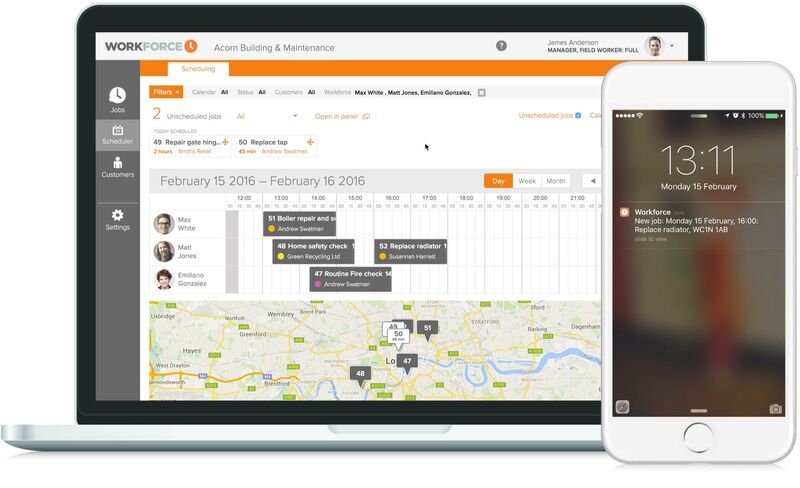 Scheduling jobs for one or more of your field team is simple with the help of Workforce’s visual drag and drop and GPS tracking mechanisms, encouraging office staff to make common sense decisions that save time, promote productivity and maximise the potential of your field team’s working day. View your field team’s current position on the map and assign work based on who’s closest to reduce travel time between jobs. When they arrive on site, your HVAC field staff can have additional capabilities to collect and share important information such as photos and customer signatures that allow them to sign jobs off on Workforce. Eliminate time-consuming paperwork and speed up your business process, while always keeping office staff in control of what permissions fieldworkers have. Workforce is designed to be used by all kinds of field service teams, regardless of technological ability. Our HVAC company scheduling software is a breeze to use, as it’s built around common sense, and job management is streamlined so that quotes can easily be converted into jobs once accepted, and jobs are turned into invoices once signed off. If your field staff get stuck at any point, we have lots of resources available, including “how to” videos and guides, and they can also ask us questions from within the app. 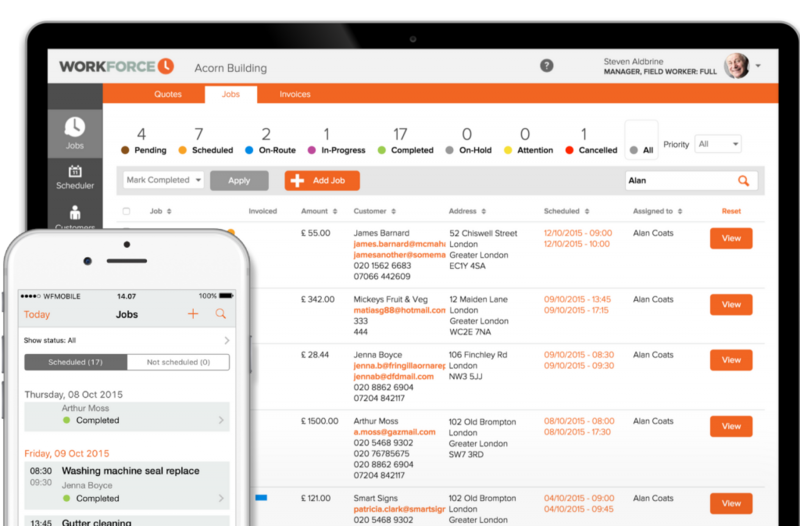 Workforce.FM makes life easier for HVAC Workers by simplifying and streamlining job management and field service operations. Our real time platform lets you schedule, allocate, track, quote and invoice jobs seamlessly. Instant photo and signature capture means HVAC Workers can do their work without worrying about paperwork. All details are synced and organised instantly across the Workforce.FM platform, keeping field workers and office-based staff up-to-date at all times.